Hwy 54 west of Guymon is now open to traffic. Residents are able to return to their homes if they were evacuated. However no electricity is in that section of the city. A Red Cross Shelter is open at the Methodist church for those in need of shelter. US Highway 64 has re-opened through Guymon. RESIDENTS LIVING IN THE ELKS ADDITION CAN NOW RETURN TO THEIR HOMES – HOWEVER, POWER REMAINS DOWN IN THAT AREA. SIGHT SEEING IS PROHIBITED AND ONLY RESIDENTS OF THE ELKS ADDITION SHOULD BE IN THAT AREA. HIGHWAY 54 REMAINS CLOSED AT THIS TIME AND INDEFINITELY. EVACUEES CAN GO TO SAFETY AT THE VICTORY MEMORIAL METHODIST CHURCH AT 5TH & ROOSEVELT WHERE THE RED CROSS HAS SETUP SHELTER. KSCB News has learned from police scanner traffic that US Highway 54 remains closed from Guymon to Goodwell. FIRES IN GUYMON ARE UNDER CONTROL – FIREFIGHTERS ARE CHECKING FOR HOT SPOTS AND CHECKING HOMES IN THE AREA. CITY MANAGER, TED GRAHAM REPORTS THAT 1500 CUSTOMERS ARE WITHOUT POWER. GAS WAS ALSO SHUT OFF TO THE AREAS IN THE PATH OF THE FIRES. 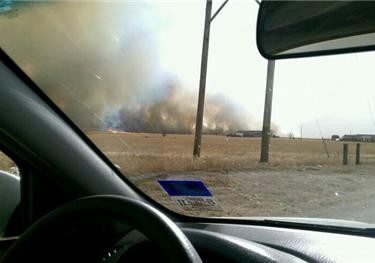 NOBODY IS BEING ALLOWED BACK IN THE AREA OF THE FIRES…IN THE ELKS ADDITION OR SOUTH SIDE OF GUYMON. SIGHT SEEING IS PROHIBITED IN THE AREA!! HIGHWAY 54 REMAINS CLOSED AT THIS TIME! SEVERAL SMALL FIRES STILL GOING ON IN SOUTHERN PART OF GUYMON. RESIDENTS IN THE ELKS EDITION, SOUTHWIND TRAILER PARK, AND SOUTHWEST GUYMON NEED TO REMAIN OUT OF THOSE AREAS. RESIDENTS IN AND AROUND GUYMON NEED TO STAY ALERT DUE TO SHIFTING WINDS AND DOWNED POWER LINES AND POLES CAUSING DANGEROUS CONDITIONS!! PLEASE STAY OUT OF THOSE AREAS SO THAT SAFETY CREWS CAN DO THEIR JOBS. THERE IS A FIRE BURNING ON THE SOUTH SIDE OF GUYMON. RESIDENTS IN THE ELKS EDITION, SOUTHWIND TRAILER PARK AND IN THE SOUTHWEST AND SOUTHEAST SIDE OF GUYMON SHOULD BE EVACUATING! !